In our food section today, we will be sharing with you all one of the most popular Igbo dish ”Abacha” prepared my members of Igboist. Igboist is a facebook group for the Igbo people of Nigeria, In their kitchen section call Igboist Kitchen, members of the group who are willing to show their kitchen talent prepares a dish which members of the group voted for. After the voting process to determine the food to be prepared, the kitchen coordinator lady Mmasinachi Jenny Emoka then announced the food to be cooked. All willing participant who wishes to join, cooks and presents their dished with their recipe and process of preparation for the rest of the member to judge by liking the most deserving dish. This addition of Igboist kitchen was sponsored by OluebubeChukwu Floxx Ezeunara. and below are the top Three dishes with the highest vote from the pre voting process. we will be sharing the dishes with the highest number votes after the end of the voting process. *Soak the Abacha in hot water for 20sec then strain it to avoid it being to soft. First you steam the kpomo and okporoko with stock cubes and a little salt, when its soft, you remove the kpomo from the stock, and keep it aside. In the stock add your ugba and stem at low heat.. Add granulated crayfish, (optional) and potash when it stems for a while you bring it down and add palm oil and mix properly.. Your ugba is ready. Then for the kpomo fry it on a low heat in an pepper source.. Your kpomo is ready. water, remove immediately and spread in a basket/ big seive. 2. Soak your palm ash in warm water, dissolve it with your hand and allow it to settle. 3. Fry your pepper and crayfish. Put in a mortar and pound. 4. Put your ogiri and Maggi in the same mortar and crush. 7. Seive the ash into the mortar and mix everything together to form Nguu. 8. Put your Abacha in a bowl, scoop the Nguu into the bowel and mix everything together. Check for salt. Set aside. 9. Wash your kpomo, put in a pot. Cook till is soft. 10. Wash your fish, steam with salt and Maggi. Cry with oil. 11. Select your Akwukwo Anara, wash and cut. Set aside. 12. Wash your mkpuru Anara with garden egg. 13. Wash and cut your onion and pepper and sat aside. 14. 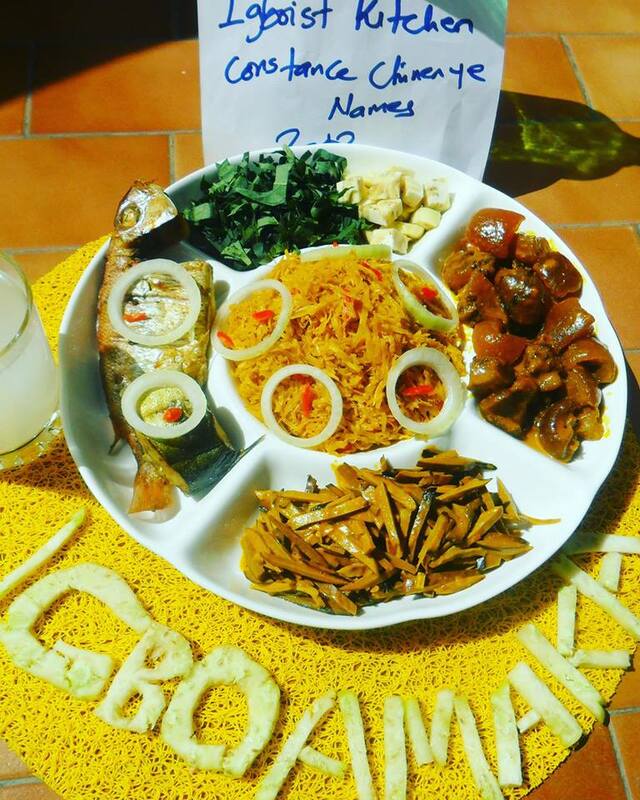 Dish your Abacha in a plate, ganish with Akwukwo Anara, Anara, pepper, onion, fish, kpomo etc. *Get your abacha mmiri ready (Tapioca). *Make a little portion of potash powdery and Soak in little water. *Put your tapioca/abacha in a pot and allow to heat for 2/3 minutes. *Add your cut mkpuru añara, ukpaka, crayfish, turn and allow to cook for 1 minute. *Add your cut onions, pepper and ogiri, salt and seasoning cubes, turn and allow to heat for another 1 minute. *Add your potash water, palm oil, turn and allow to cook for another 1 or 2 minutes. *Add your cut vegetable (Akwukwo añara), turn and bring down. *Serve with your Palm wine! All this food looks so delicious! I’m definitely going to have to try some! Oh this looks amazing and so flavorful!! All of today’s “Abacha” dishes look delicious. Thank you for sharing.